Emerald necklaces are highly regarded and are being referred to by many as some of the most stylish and powerful pieces of jewellery. With the bold centrepiece emerald gemstone accompanied by a lustrous array of diamonds all set on 9k and 18k yellow and white gold, our Emerald Pendant Necklaces come in various shapes and styles and are bound to captivate you! Being May's birthstone the Emerald symbolizes Spring, fertility and positive energy. Did you know that many Celebrities also have Emerald Pendant Necklaces as their go to piece of jewellery? A few names include Kate Middleton, Angelina Jolie and Julianne Moore! Some of the most notable emeralds include: The Bahia Emerald, the Carolina Emperor Emerald, the Chalk emerald, the Duke of Devonshire Emerald, the Emerald of Saint Louis, and the Patricia Emerald, with the Bahia Emerald measuring a whopping 180,000 carats!!! Which roughly translates to 341 kilograms!! 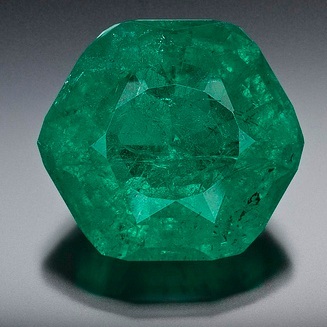 This gigantic precious stone is essentially an array of very sizable emeralds stuck in a host rock. This stone originated from Brazil and it has a really intriguing history. It narrowly escaped a flood in 2005. This happened when the Hurricane Katrina struck and at that time it was stored securely in a warehouse somewhere in New Orleans. After this narrow escape it was reported stolen from a vault in Los Angeles! Truly, an adventure fitting for the king of emeralds! The emerald as a stone also symbolises growth and can be presented to a loved one as a symbolic gift for the growth of an upcoming relationship. Diamond Treats offers a satisfying array of luxurious Emerald Pendant Necklaces that will surely leave a mark if given as a gift! Treat your loved one with a luxurious piece of contemporary jewellery, an emerald pendant necklace they will never forget and will be their favourite piece of jewellery forever.